You love experiencing wildlife up close. You love safaris and seek to experience the world's best safari destinations. Tanzania is at the top of your list. This immersive safari speaks to the animal lover’s soul: an exciting adventure that takes you straight into the heart of Tanzania’s best wildlife viewing areas. Venture into the plains every morning for full days of spectacular wildlife viewing and unwind in luxurious, eco-friendly camps located in the middle of the wild. Each night, settle into comfortable, downy bedding and drift asleep to the nighttime sounds of safari. On this all-luxury camping trip, you’ll have front-row access to the best wildlife viewing Tanzania has to offer. Airport transfers for Delta/KLM flights at the beginning and end of the tour and more! Welcome to Tanzania! After being transferred from Kilimanjaro Airport to Arusha in the evening, you’ll be warmly welcomed by your tour guides at your first lodge. Set beside the rushing waters of the Usa River on the outskirts of Arusha, Rivertrees Country Inn has colonial charm and simple but elegant style with modern-day amenities and fantastic cuisine. You can enjoy easy walks through the inn’s gorgeous gardens and along the river, which is lined by yellow acacias and giant fig trees, both abundant in vibrant birdlife. Today we head to Tarangire National Park, where diverse wildlife viewing awaits. Spend the morning wildlife viewing in Tarangire, searching for animals and birdlife among Tarangire’s river valley. In the afternoon, explore the banks of the Tarangire River, where large families of elephant often gather. Thomson’s Tarangire Nyumba is set in a scenic, private location close to the Tarangire River and with easy access to seasonal and resident wildlife. Here, you will experience exceptional service from the friendly staff, eat gourmet meals prepared from fresh, local ingredients and enjoy the privilege of sharing the landscape with the wildlife. Today, continue exploring more of the park, taking in the diverse wildlife. Guinea fowls scurry alongside your vehicle and leopards sometimes lurk in the grasses near the road. You never know what’s around the next corner. Temperatures also cool off and the big cats wake from their midday naps during the afternoon, so this would be an ideal time to take in the surreal scenery! Drive from Tarangire into the Ngorongoro Highlands via the impressive Great Rift Valley escarpment. Ngorongoro Highlands’ rich volcanic soil makes for some of the most fertile land in Tanzania. Go on a guided bike tour through the countryside and into a local community. Tours are available for bikers of all levels. Located on the outskirts of Karatu, a quaint country town on the Great Escarpment, Country Lodge is situated in the centre of Northern Tanzania’s green belt district and farming community. Drive a short distance to Ngorongoro Conservation Area, a wildlife and cultural preserve that covers 3,200 square miles. Descend into the Ngorongoro Crater, where you are likely to find an abundance of wildlife. Over a full day of wildlife viewing, you might even see rhinoceros—the diversity of species often inspires awe. Also, enjoy a traditional Tanzanian dinner tonight! 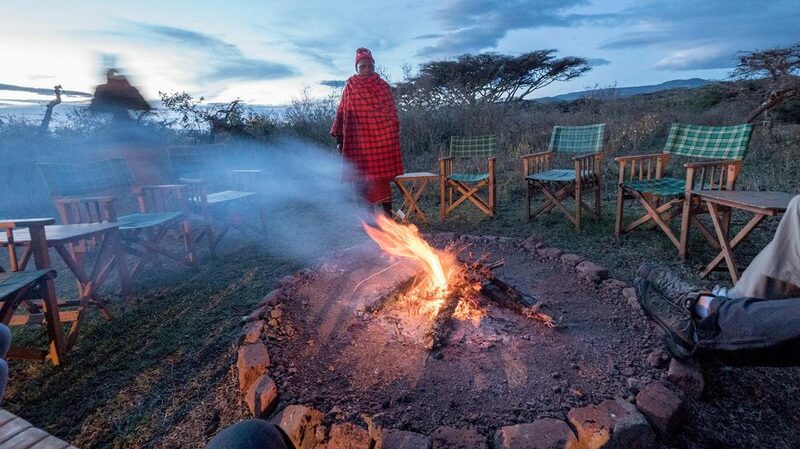 This Nyumba is located at the rim of Ngorongoro Crater where it is poised for optimal access not only to the nearby cultural treasures, but also to the crater floor where you will experience exceptional wildlife viewing. The air here has a heavenly fresh scent, though the high elevation (about 7,200 feet) makes for potentially chilly nights; it’ll be important to bring warm clothes, per your packing list. The exceptional camp crew will make sure you have everything you need to stay comfortable, for example, making sure hot showers are available in your en suite bathroom, preparing delicious fourcourse meals and offering you drinks or snacks around the roaring camp fire. Today, continue your exploration of the crater, searching out more wildlife and taking in some of the most impressive scenery in Africa. Also, be sure to take some time to relax at your camp and reflect on all the awe-inspiring things that you’ve seen in Ngorongoro! Arrive on the great Serengeti plains for a different—but just as spectacular—wildlife viewing experience. Today, make a short stop at Olduvai Gorge, a deep ravine and site of fossilized remains of animals and hominids that date as far back as two million years. A brief lecture and small museum tour are included. Spend the rest of the afternoon wildlife viewing in the Serengeti. Kubu Kubu Tented Camp offers a luxurious and modern African experience in the heart of the Central Serengeti. After your game drive, you can relax in the comfortable lounge area, enjoy a fine meal, or unwind in the pool before heading to your spacious ensuite tent. Today, those with advance reservations will have the opportunity to balloon across the plains during one of your mornings in the Serengeti. A pre-dawn wake-up call leaves you time to drive to the balloon launch site to catch the most dramatic light. Then take to the skies just as the sun rises. After your descent, enjoy a champagne breakfast right in the midst of the Serengeti wilderness. Today, continue your exploration of Serengeti wildlife and its rich landscapes. 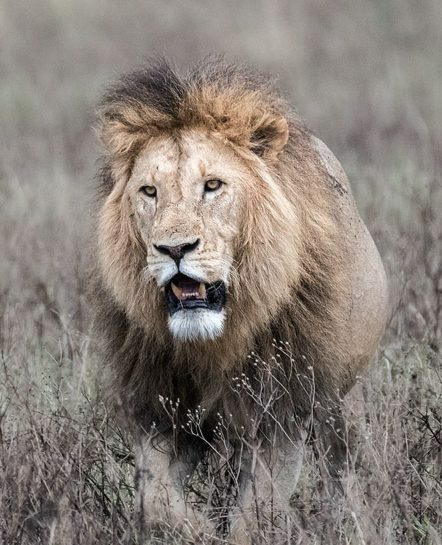 The so-called "Big Five" game and the "Great Migration" are the most well-known of the Serengeti’s offerings, but there is much more to see. Thousands of equally fascinating dramas of a smaller scale play themselves out on these endless plains. Faida (“goodbye” in Swahili)! Today is your last day in Tanzania—enjoy your last views of the Serengeti before we depart for Arusha. After a farewell snack, we'll transfer to Kilimanjaro Airport, where you’ll catch your connecting flights to your final destination.